Patrick Ireland, a survivor of the 1999 Columbine High School shooting and Craig Hospital “graduate,” will be awarded the Christopher and Dana Reeve Inspiration Award at the Craig Hospital PUSH dinner on Friday, February 27. This award is given in recognition of Ireland’s determination, advocacy, and commitment to serving as a positive and influential role model to those who have sustained a traumatic brain or spinal cord injury. 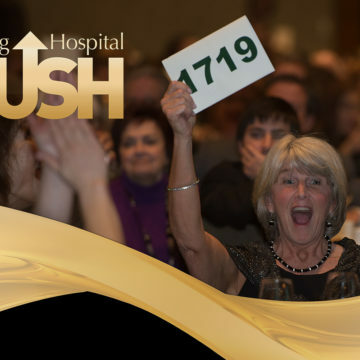 The gala event, sponsored in 2015 by Empower Retirement, raises money to support Craig Hospital’s programs and research. The event will be attended by more than 1300 people and is expected to raise more than $1 million for Craig. 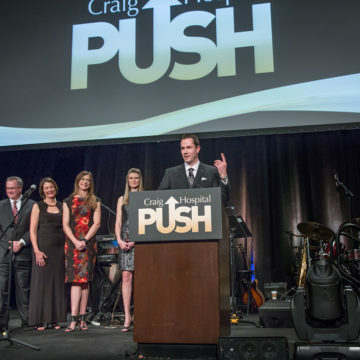 Proceeds from the PUSH dinner fund Craig’s Programs of Excellence – like Therapeutic Recreation, Assistive Technology, Music Therapy, Community Reintegration and education and tutoring programs. Funds also support research, including ongoing studies and clinical trials aimed at improving outcomes, reducing long-term complications, and enhancing quality of life for those affected by spinal cord and traumatic brain injury. The PUSH paddle auction raises funds for the Craig Hospital Foundation’s Patient Assistance Fund, which helps patients travel to and from Craig, purchase equipment like wheelchairs and shower chairs, remodel homes for accessibility, train caregivers, pay mortgages and college tuition, and meet other urgent needs. Friday, February 27, 2015Cocktail Hour: 5:30-7 p.m. Dinner: 7 p.m.Steve Peters and Patrick Ireland videos and award presentations roughly 8:00 p.m.
Steve Peters and family, Patrick Ireland and family, Craig Hospital staff, board members, donors and supporters. Members of the press are invited to capture b-roll or photos of the dinner and cover the award presentation. Brief interviews with the honorees may be available during cocktail hour. Please call or text Jordan Ames, Craig Hospital Foundation communications manager, at 720-231-0267 if you plan to attend.